Pacemakers and implantable cardioverter defibrillators are medical devices that are implanted in the chests of patients who have heart abnormalities. But what are the differences between these two devices? Here are some useful details explaining their physical attributes and their functions. A pacemaker is a small medical device that helps control heartbeats through electrical stimulation. It uses electrodes to send impulses to the heart to maintain a regular heart rate. Doctors recommend pacemakers when a person’s heartbeat is too slow, too fast, or irregular, such as in arrhythmias. They are also used when the heart’s electrical pathways are blocked. 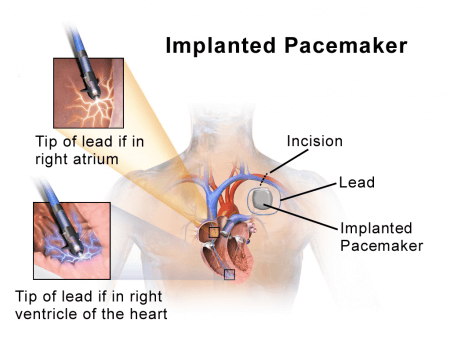 These pacemakers are implanted under the skin, just under the collarbone, and are connected to the heart through small wires. Individuals who only need to use pacemakers for a short period may use types that can be attached outside of the skin with the batteries worn as a belt. There are many types of pacemakers. An implantable cardioverter defibrillator (ICD) is a slightly larger device than a pacemaker. It is implanted under the skin just under the collarbone. Its components function the same way as a pacemaker, only that it is made to deliver two types of electrical impulses. It monitors heart rhythms in that when it senses any abnormality in the heartbeat, it sends a low energy shock that normalizes the heart. In cases of severe cardiac arrhythmias, it sends out high energy shocks. Therefore, ICDs are prescribed for patients that are at risk for sudden cardiac death due to ventricular fibrillation or tachycardia (abnormally fast heartbeats). Their most important functions are defibrillation, cardioversion, and pacing of the heart. So what is the difference between a pacemaker and an implantable cardioverter defibrillator? There is only a slight difference in their physical attributes. The obvious contrast is their main function. The pacemaker regulates heart rhythms that are abnormal, while the ICD monitors heart rhythms and corrects them. Pacemakers are usually used by patients with slow heartbeats, (bradycardia), or patients with heart blocks, which may be due to old age or previous heart attacks. They can also be prescribed for congenital heart disease patients. 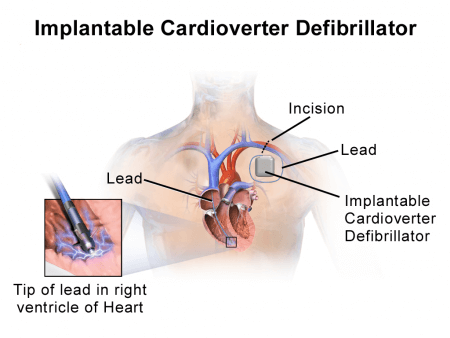 Implantable cardioverter defibrillators, on the other hand, are recommended by doctors to patients who have suffered and survived sudden cardiac arrest. They are also essential in treating high-risk ventricular arrhythmias, a condition where the ventricles of the heart beat too fast or quiver. Some, but not all, ICDs are capable of acting as pacemakers. Here is a video about a patient, Bob, who has an implantable pacemaker after collapsing in the gym. Here the differences between the pacemaker and the defribillator are further explained.